Deuces Wild has become one of Australia’s best-loved versions of video poker – and for good reason, as this is one of the few casino games where players can hold the edge over the house. But what separates this game style from other forms of electronic poker, and where can Aussies enjoy Deuces Wild on the Web? Our recommended Internet casinos above all boast dozens of classic video poker titles, including selections from Microgaming – the leading developer of real money gambling software in the world. Furthermore, each of our trusted AUD gambling websites caters for 21st-century punters with cash video poker for iPhone, iPad, Android, BlackBerry, Windows Phone and other popular devices. Aussie gamblers can rest easy knowing that all our top casinos are fully licensed and accredited, and that every AUD transaction is safeguarded by 128-bit SSL (Secure Socket Layer) Digital Encryption for 100 per cent secure banking. 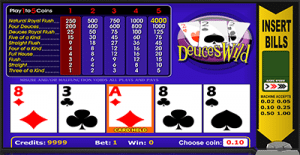 Like most video poker styles, Deuces Wild is derived from the traditional poker game known as Five Card Draw. Players are dealt five cards, decide which ones they wish to keep and which to throw away, and then receive new cards to replace the discards. In video poker, we ‘hold’ a card by clicking or tapping on it; to swap the rest for new ones, we click ‘draw’. Four Deuces: A hand made up of all four Twos in the deck. Five of a kind: Four cards of the same rank plus a single Deuce (e.g. K K K K 2). Wild royal flush: Ace-high straight in one suit, where one or more of those cards is replaced by a Deuce (e.g. A K 2 J 10, all Clubs). A number of varying pay scales can be applied to Wild Deuces poker, but the overwhelming majority of Web versions pay a top jackpot of 4,000 credits. The image below shows the various payouts for online Deuces Wild at Royal Vegas; the left-most column shows returns for the minimum one-coin bet, while the right-most corresponds to the maximum five-coin wager. When played with perfect strategy, full pay Deuces Wild can present a theoretical return of 100.8 per cent to the player. That means we, the punters, get the advantage for once, while the casino runs at a probabilistic loss of 0.8 per cent – that is, a negative house edge. To take full advantage of these odds, we recommend Australians bet the maximum five coins per turn every time; this is because the 4,000-coin jackpot for a natural royal flush tilts the figures in our favour. The table below shows the difference in house edge depending on how much is wagered per hand. These figures are based on optimal strategy, which is rather complex and can take months, even years, to memorise. However, there is a simpler strategy formulated by gambling guru Michael Shackleford which produces a theoretical return of 100.7 per cent in full-pay games and is much easier to follow. It should also be noted that Internet-based Deuces Wild poker, such as the Microgaming titles found at Royal Vegas, don’t offer quite as favourable theoretical returns as full-pay versions. The standard one-play Deuces Wild game has a house edge of 3.23 per cent, making it one of the worst-value online video poker games around. However, the multi-hand Deuces Wild Power Poker release is much more alluring, with a casino edge of just 0.63 per cent (theoretical return 99.37 per cent). Try Deuces Wild Power Poker now at Royal Vegas Casino. That may seem like a lot to digest at first glance, but it’s fairly straightforward once you break it down. And the beauty of playing over the Internet is that we can always keep a cheat sheet handy and refer to it whenever we need, and you can also try games first for free play to get a hang of things before you risk any of your own money. To give you a better idea of how this system works, let’s say we are dealt the following hand: Deuce, Deuce, Jack of Hearts, King of Hearts, King of Clubs. Here, we can either stick with the four of a kind (made up of two Kings and two wilds), or opt to play for a wild royal flush in Hearts. Under the ‘Two Deuces’ list, the four of a kind is ranked number one and is therefore the best strategic play. Deuces Wild games often come with a ‘double’ or ‘gamble’ feature, where we can play a double-or-nothing bonus game whenever we hit a paying hand. For example: if we draw three of a kind and win five coins, we can then bet that amount on a random outcome (e.g. red or black) in the hope of collecting 10 coins; if we win that wager, we can go again with 20 coins up for grabs, and so on; but if we lose the bet at any point, we forfeit the entire amount including our original five-coin payout for the three of a kind. The double-up feature carries no house edge, which means in full-pay games it is actually worse value than a normal hand when sticking to simple strategy. However, most Web-based Deuces Wild games have a theoretical return of less than 100 per cent, so taking the gamble when playing online is a perfectly valid strategic move. All of our recommended Australian casinos offer multi-hand Deuces Wild games that allow us to play several hands at once. The Net Entertainment version featured at House of Jack gives us the option to play five, 10, 25, 50, or even 100 hands at a time. The selling point for this format is that if you are dealt a rubbish hand, it is quite possible to hit a stack of big winners on the draw; and if the deal happens to deliver the goods straight away, then you get up to 100 wins for the price of one. Our favourite multi-hand option is Microgaming’s Deuces Wild Power Poker. As we mentioned earlier, it offers a far better theoretical return than its one-play counterpart (99.37 per cent against 96.77 per cent), and playing four hands at a time allows you to increase your winning potential without having to cover 50 or 100 plays per bet. Solid value, we say. Play real money Deuces Wild and more video poker at Royal Vegas Casino, our top Australian gambling site, where new players can claim up to $1200 in welcome bonuses.